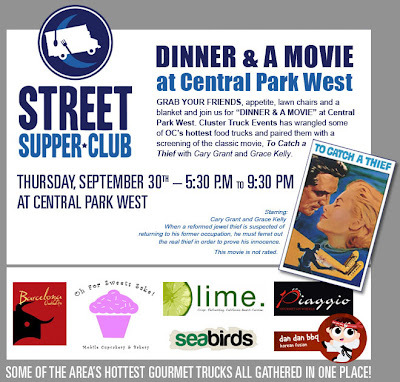 Central Park West will host Street Supper Club and Movie Night featuring To Catch A Thief. Bringing in six of Orange County’s hottest trucks. This is the first nighttime gourmet food truck event at this site. They have a very good turn out when they do lunch events at this location. Make sure you bring some chairs to sit on so you can stick around watch the movie and eat some great food. The event starts at 5:30 and will go to 9:30pm. To Catch A Thief will begin at 7:30pm.